So I’ve decided to go into the fast food menu development business. It seems pretty easy. Here are some free ideas: McDonald’s adds French fries to its Big Mac and calls it the “Pittsburgh Mac.” How about the McLandSeaAir? A Quarter Pounder with a Filet-O-Fish and McChicken patty layered in. For KFC, a fried chicken po’boy: Dice up Original Recipe chicken, place it between some buns, and slather it with mashed potato gravy. The job would just require going to a restaurant chain, assessing all ingredients on hand, and finding a way to reconfigure existing dishes into barely new menu items. It’s the food version of shuffling deckchairs. 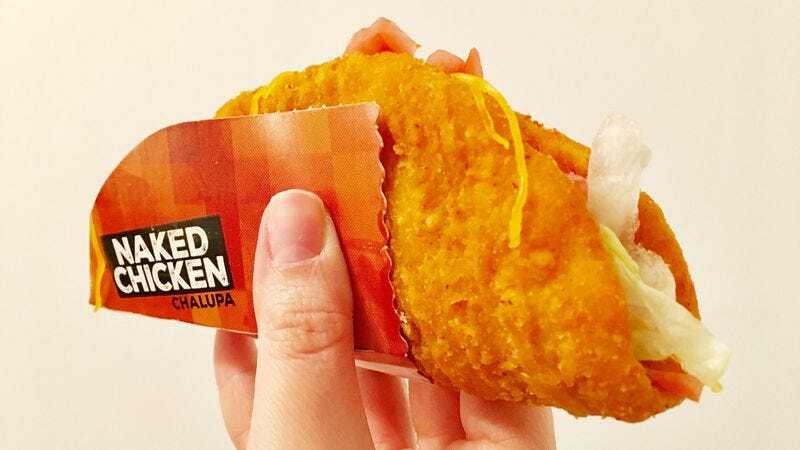 Take Taco Bell’s latest mashup, the Naked Chicken Chalupa. It’s a dish designed to provoke consumers with exaggerated outrage, because its conceit sounds so decadent: a piece of fried chicken, replacing a taco shell. It’s low-hanging fruit made for food websites (present company included) to write up, use lots of hyperbolic adjectives in the headline, then wait for the comment section to do its righteous evisceration. As with so many of these fast-food innovations, what Taco Bell has performed here is addition by subtraction. It’s taken a fried chicken sandwich, saved cost by eliminating the buns, deployed its publicity and marketing departments, then charged consumers a premium for its new item status. It’s marketing genius first, culinary inspiration a distant second. What it is not, as one might naturally assume, is an actual taco with fried chicken for its shell. There’s no ground beef inside. I understand if you feel duped. Instead, the Naked Chicken Chalupa is simply diced tomatoes, shredded lettuce, some indiscernible sauce (avocado ranch, they say), and melted cheese, all pressed into a moist amalgam. The sole revolution here is that the fried chicken patty is folded in half, full stop. It’s not nearly as avant-garde as a KFC Double Down, which was as disgusting as it was novel in its inversion of the starch-protein balance. It’s an ordinary piece of chicken, shaped vaguely like a taco. And what does it taste like? A slightly spicy breaded chicken sandwich, minus the bun. The Naked Chicken Chalupa is neither offensive nor particularly delicious; it sits firmly within the range of tastiness that all Taco Bell food resides, somewhere between C- and C+. Like 72 oz. steaks or ghost pepper death wing challenges, the Naked Chicken Chalupa is in the category of food you don’t eat to satiate yourself. It’s food you consume for the benefit of others on social media. Actually enjoying it seems to be beside the point.